The follow up to the very popular Far Cry was a bit of a Marmite game. For everyone who hated the driving and endless re-spawning checkpoints, there was someone who loved the the free-roaming nature and the fact that, contrary to its predecessor, the developers didn't get lazy and turn it into a generic mutant/alien blast fest. We definitely were on the adoring side with Far Cry 2 and anyone who has laid on the cliffs above the rail-yard sniping people with the dart gun is sure to agree. The one thing we all agree on though is that this is sumptuous. With DirectX 10 and all the bells and whistles on it still stands up well today. 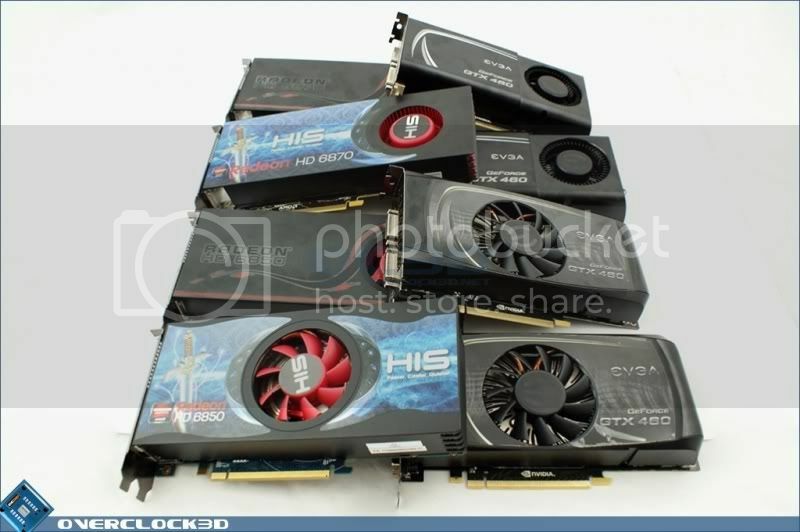 The only one of our four cards that stands out is the 768MB GTX460 being 10fps behind its bigger brother. Considering we're up at 16xAA and this monster resolution it's fair to say it is probably just running out of GDDR5 to handle everything. This is especially noticeable with the minimum frame rate a long way behind the others. Otherwise it's all much of a muchness with no card able to quite hit the 60FPS mark we yearn for. As we saw with Crysis Warhead though, a boost to the GPU Core on the GTX460 768MB really gives a good reward. Here it's an extra 5 frames per second. The 1GB GTX460 benefits most, being able to maintain a 63 FPS average at these settings in very impressive. The Radeons again prove to be a bit disappointing in how well they respond to having their pants set on fire. Hopefully putting two together should help. Help it most certainly does. Theoretically with 100% efficiency the HD6870 should average 116FPS in Crossfire and the HD6850 should see 108FPS. Having 112FPS and 95FPS respectively really demonstrates, especially with the HD6870, how little performance is lost in modern twin-card setups. That isn't to suggest the GTX460s fair badly at all being only 10 and 8 frames behind what we'd see if there really was zero performance loss in an SLI setup. Such are the vagaries of testing that not everything follows the pattern you'd expect, or even gives a result you can explain. The HD6850 which, until now, has been as stubborn as a mule in concrete in showing any improvement when overclocked suddenly finds 7 extra frames per second to play with. Whilst the GTX460 1GB, until now an overclocking triumph, decided it just was bored and wouldn't even perform as well as it did at stock. All still comprehensively batter Far Cry 2 into submission, but it's a perfect demonstration of why we run the tests rather than just tell you what should happen.